Choose a kick sound a get sequencing. Perhaps the most important element of the drum kit in today's music, the kick drum is the driving force in any dance track, and the rhythmic anchor of rock and pop. Positioned on its side on the floor at the front right of the kit (for a right-handed drummer), the kick drum, also known as the bass drum, is usually between 20" and 24" in diameter and 14" or 16" deep. The drummer plays it with a pedal-operated beater, the head of which can be made of felt, plastic or wood - each delivering an increasingly hard attack - using their lead foot, while the other foot controls the hi-hats. Many metal drummers employ two kick drums, or a double pedal enabling both feet to play a single one, giving them the ability to play the incredibly fast passages the genre demands. 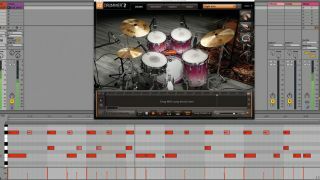 In electronic music, kick drum sounds are often created using synthesis-based drum machines, or composited from a mix of samples and/or synthesised parts - one for the attack, another for the decay, for example. Indeed, there are a few 'kick drum design' plugins on the market now dedicated entirely to doing exactly that, the two best known being Sonic Academy's KICK and Plugin Boutique's BigKick. In this tutorial, we'll walk you through the basics of kick drum programming for electronic and 'live' tracks using both sampled and synthesised sounds. Step 1: Here's the electronic kick drum at its most basic and primal, hammering out a solid, relentless four-to-the-floor pattern, as heard in EDM, house, techno and all their many sub-genres. Simply place a hit on every beat of the bar at full velocity, throw in a backbeat snare and an offbeat hi-hat, and Bob's your dancefloor. Step 2: Emulating the kick drum of an acoustic drum kit, as played by a live drummer, requires a far more nuanced, considered approach than simply nailing a four-square beat. As a general rule, a real drummer will follow the bassline with the kick drum, the idea being to reinforce the former's most important notes, rather than simply double up the whole part. Step 3: Ghost notes are usually mentioned in reference to the snare drum, but they're also relevant to the kick. Whereas snare ghost notes can be placed anywhere in a pattern to add momentum to a groove, kick ghost notes almost always lead directly into a main, full-strength hit, rather than occurring in isolation. Step 4: With a conventional single pedal, most drummers can only play two kick drum notes in rapid succession, so bear that in mind when programming fast patterns. If in doubt, tap your lead foot along with the part - if you can't accurately keep up without a pedal, then chances are it can't be played with one. Step 5: Add in a second bass drum, though, and there's no real limit to the pace of your kick patterns. Separate left and right kick drum samples sound more 'human' than the same one doubled up, but the same sample can be preferable if you want a super-tight, mechanical feel. Step 6: In DnB, hip-hop and other dance and electronic styles, the kick drum is frequently extended to serve almost as a bassline in its own right. For a classic sub bass kick, take a sine-based sound, and raise its decay or sustain until the tail becomes effectively a 'note' that can be pitched up and down to fit the track.